History was made when the first two ofa the Coast Guard’s Legend-class cutters, Bertholf and Waesche, were photographed during their transit together on the waters off the coast of Southern California, Feb. 26, 2010. Ultimately eight of these highly capable 21st century vessels will be built for the Coast Guard. U.S. Coast Guard photo by Petty Officer 2nd Class Jetta H. Disco. 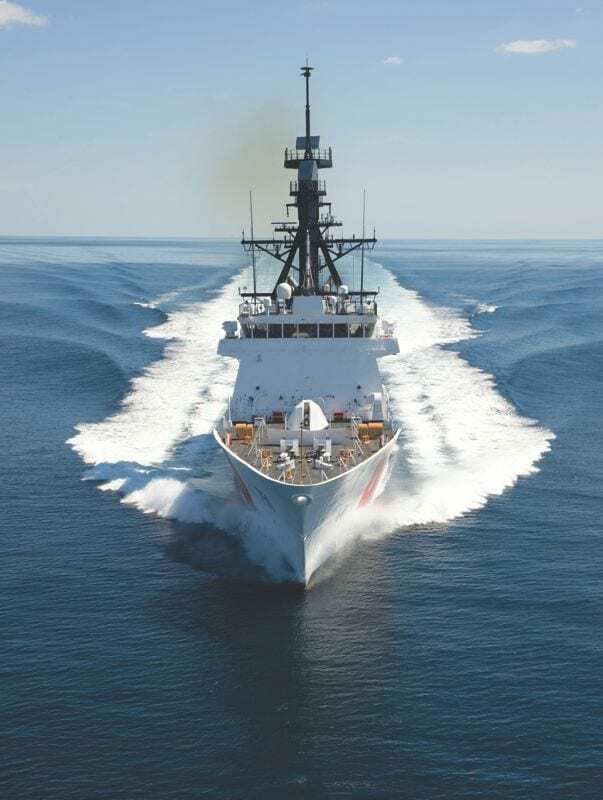 What the U.S. Coast Guard (USCG) wanted as it put its new flagship class of cutters to sea was range, flexibility, and power. So far, the new national security cutters (NSCs) haven’t disappointed. Sure, it helps that the ships have a maximum steaming distance of 12,000 miles, a high-end speed of 28 knots, and 60 days of endurance without resupply if necessary. This means the ship will be able to deploy and contribute on larger missions, such as being part of a Navy battle group deployed around the globe, in addition to working alone or with state and local agencies with just as much effectiveness. Called the Legend class because each ship is being named for significant Coast Guard leaders of the past, the service has already taken charge of their first two ships, the CGCs Bertholf and Waesche, and is waiting on a third that is being built. Bertholf, commissioned in 2008, is currently spinning up for its first deployment, scheduled for sometime in 2011. Not far behind is the Waesche. Commissioned in May 2010, it’s going through the final stages of acceptance, a milestone that’s expected to be completed by November 2010. The third cutter, Stratton, was christened on July 23, 2010, by first lady Michelle Obama at Northrop Grumman’s shipyard in Pascagoula, Miss. The service hopes to get preliminary delivery by late 2011. The Coast Guard has yet to contract for the fourth ship, but that is expected to be in place soon. In all, there are scheduled to be eight ships in the Legend class, replacing the 12 378-foot Hamilton-class cutters that were designed and built in the 1960s and 1970s. At 418 feet long, the Legend class will be the largest “white hulled” cutters in the fleet, 2 feet shorter than the service’s icebreaker Healy, which is currently the largest ship in the service. It displaces 4,500 linear tons and has a draft of 30 feet when fully loaded. The ship will accommodate 148. So with a crew size of 124, it has room to carry more people, such as law enforcement detachments, for special missions. Berthing and living conditions are to modern standards, which means that the individual berthing area will be more like staterooms, with fewer people in each. This also gives the service the ability to have multi-gendered crews. For the first time, a Coast Guard cutter will be equipped with a Collective Protection System (CPS). This is a system that’s currently in use on Navy destroyers and cruisers. A CPS allows a ship to operate, when necessary, where a chemical, biological, or radiation threat exists by pressurizing the air inside the ship slightly higher than what’s outside to keep out contaminants. Meanwhile, it also cleans the air inside with an extensive system of filters. Some of the largest leaps ahead in technology for the crew will be the increase in combat systems as well as command and control capabilities. Like the Sentinel class of fast response cutters, it represents a huge leap forward in ability to update any national or international intelligence picture while on station. The ships will not only have the horsepower to operate with Navy battle groups and contribute heavily, they will just as effectively operate with state and local fire and police departments. The weapons that the ship was designed with will be more than capable for ships self-defense as well as projecting power when necessary. The primary weapon system will be the Mk. 110 57 mm naval gun, a multi-purpose, medium-caliber gun. Based on the Bofors 57 Mk. 3, the Mk. 110 is a self-contained and self-loading weapon capable of firing 220 rounds per minute with a range of nine miles. It’s the same weapon the Navy is putting on its littoral combat ships and the new Zumwalt-class destroyer, currently under construction. The NSC will also have four .50 caliber machine guns as well. As for defense, the cutter will be outfitted with the 20 mm Close In Weapons System, along with the Mk. 53 Nulka decoy launching system that will protect the ship from a missile attack. With much more room on the national security cutter it becomes a considerably more capable platform, because if needed, more sensors and weapons can be added. A combined diesel and gas (CODAG) propulsion system powers the ship, with two diesel engines and a single gas turbine. “The diesels can handle it when a slow speed is required and they can work together with the gas turbine when needed to go fast,” said Oittinen. But what may appeal to every Coast Guard engineer is the flexibility. On most ships, propulsion is very linear – each propeller and shaft was driven by a separate set of engine and reduction gears. Previously if one engine, shaft, or screw went down, half the propulsion plant was useless, as there was no way to cross operate any of the components. That’s all changing now as the Legend-class ships come online. Unlike most ships, the NSC has a new reduction gear design that allows it to run either shaft from either diesel or the gas turbine. The ship can cruise with the gas turbine and/or a single diesel driving both shafts, or one diesel driving each shaft, basically any combination. 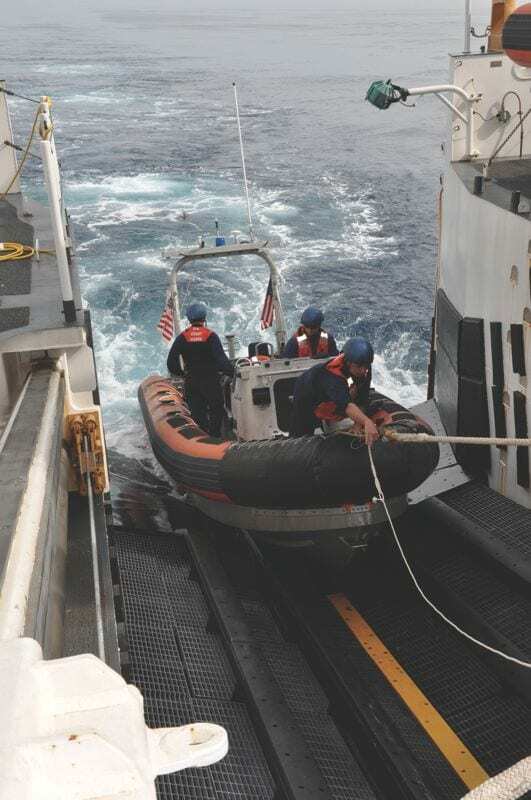 Not only is the Coast Guard’s ability to operate dependent on the ship’s capabilities, it’s also heavily reliant on embarked smallboats as well. Called “cutterboats” by the service, the design of these smallboats has experienced a revolution in recent years that increases the range and effectiveness of their mother ship. And with a stern ramp on the NSC, the smallboats can be launched and recovered more quickly and efficiently. The Legend class will deploy with three cutter boats. All three boats will have a significant communication system upgrade. For years, standard radio gear didn’t allow a ship’s smallboat to communicate with its “mother ship” when not in “line of sight.” Now most of the boats are being upgraded with better electronics that let them operate miles away from their ship and still be in voice contact. The Legend class is also the most aviation-friendly cutter. For the first time, a white-hulled Coast Guard ship will be outfitted with twin hangars capable of storing two HH-65 Dolphin helicopters. With a flight deck that at 2,324 square feet is 35 percent larger than on the 378s it is replacing, the ship can not only handle all types of USCG helicopters, but any in the DoD inventory. And there are plans to add unmanned aerial vehicles into the mix as well. “We don’t have a UAV yet, but there’s space and weight reservations provided both on the flight deck and in the hangar,” Oittinen said. Because the Legend class will have four fewer ships than the class it’s replacing, officials say they will spend considerably more time under way. To accomplish this, the service will eventually adopt a multiple crew manning concept, with four crews that will rotate between three ships. At this point, the shore infrastructure isn’t in place for the extra crews, as facilities, living, and training spaces have yet to be built. This concept will be a factor in the selection of future homeports for the Legend class ships. For now, Coast Guard Island in Alameda, Calif., will be the only homeport for the Legend class. This article was first published in Coast Guard Outlook: 2010-2011 Edition.